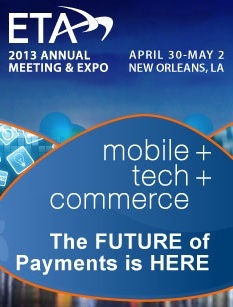 We’re one day away from the 2013 Electronic Transactions Association (ETA) Annual Meeting and Expo, one of the world’s largest stages for payments innovation. The event will feature more than 200 exhibitors and 3,000 executives, payment professionals and members of the media at the Ernest N. Morial Convention Center in the heart of New Orleans. As an ETA member and previous attendee, we’re thrilled to exhibit our white-label, turnkey business solution — ReceivablesPro at this year’s event. The four day meetup brings together buyers and sellers from every element of the payments industry. It’s a premier opportunity to spread innovation, collaborate and meet with representatives of enterprises looking to expand their small business offerings. If you happen to be headed to the Pelican State for the 2013 ETA Annual Meeting and Expo, please stop by booth 137 and say “hi” to David and Nicole! If you’re interested in learning more about ReceivablesPro or partnering with PaySimple, visit PaySimple.com/Partners.